The 5 Stages of Violent Assault represents a model for understanding the predatory mind in assault situations. 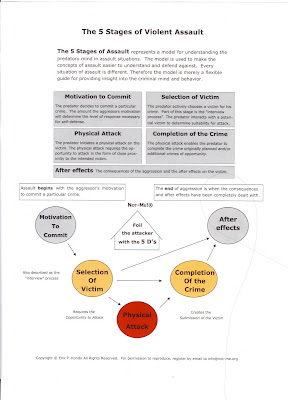 The model is used to make the concepts of assault easier to understand and defend against. Every situation of assault is different. Therefore the model is merely a flexible guide for providing insight into the criminal mind and behavior.